Viewing topic "motif2text App For Mac Released"
Thanks to Vikas Sharma, we now have a Mac version of motif2text, an app that reads Motif files and displays their contents in human-readable form. All you need to do is download the .zip file, unzip it, and then double-click on the app. A screenshot of what the app looks like is attached. Please post any bug reports you have to this thread. What exactly is motif2text? A text backup tool? Sorry, I missed that. is it motif only? Thanks. I just edited the initial post in this thread to describe the purpose of the app. 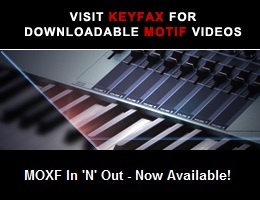 It reads files produced by the Motif XS and XF. The app is downloadable from the first post in this thread. What sort of link are you requesting? Sorry, I thought you were referring to another post. I see that updated one up there now. This is really brilliant work. Thanks a lot. A Windows version is available. See first post in this thread. I tried downloading the file and opening it on my Macbook Pro, but it does not open, states the file may be corrupted. Any suggestions? Added screenshot to first post of thread. At this point, it would be helpful if others who have downloaded the app could report back on whether or not it worked for them. That information can help us figure out what’s going wrong for robinvt. Please include which model of Mac you have, and which version of the MacOS you are running. One simple thing would be to try downloading it again. Perhaps it got corrupted the first time you downloaded it. I’ll give it a shot. You may choose to ignore this, and it may be wise to do so. Judgement call. First thank-you for all your hard effort with this for the benefit of others, along with thanks to Vikas and 5pin as well. Mac ibook G4 10.4.11 Tiger. Downloaded link, it appeared on the screen and I clicked on it. It attempts to open briefly in applications. For reasons unknown I highlighted the icon, clicked file and removed the .app from the file. Went back to desktop and clicked icon and the icon opened. Downhill from there, met some darwin deal. At that point I bailed. I just got this machine out of the shop after deleting the hard drive. I have a new Mac Book Pro that can give it a shot with later, at the very least it might give the computer shop something to do tomorrow. 10.8.5 No go as well. Thanks again, it’ll happen, no doubt. OS X 10.9.1, 2.9 Ghz Intel Core I7, 8 GB 1600 Mhz DDR3. Tried downloading again, still won’t open even though I told it to “open anyway” , because it is not from an approved vendor. The Windows version is working well at this time, and I have faith that any difficulties with the Mac version will get worked out. I just downloaded the motif2text-1.1.zip (Size: Approx: 4.7MB) file from the link provided by Michael Trigoboff in the 1st post of this thread. After downloading to my default Downloads folder, it got automatically unzipped to the same folder creating a file called motif2text-1.1.app (Size: Approx: 10.9MB) and deleting the .zip file to Trash. The .app extension, by default, is not visible on most computers. Also, you might need to manually unzip the file if it doesn’t automatically unzip in your case due to system-specific settings. Since the file is downloaded from the Internet and is not signed by the developer, OS X might prevent you from opening the app by just double-clicking on it and instead pop the following error message (See attached pic motif2text-1.1-opening-error.png). “motif2text-1.1" can’t be opened because it is from an unidentified developer. Your security preferences allow installation of only apps from the Mac App Store and identified developers. If you get the above error, you need to control-click (press and hold the control-key while clicking) the app and then choose Open. You might now get the following warning message (See attached pic motif2text-1.1-opening-warning.png). “motif2text-1.1" is from an unidentified developer. Are you sure you want to open it? Opening “motif2text-1.1” will always allow it to run on this Mac. Click on Open. The app should now run (hopefully) in a window as shown in the attached pic motif2text-1.1.png. You may click on the Help button (or simply press h) to open the PDF help file including with the app. I have built and tested this app on my MacBook Pro which has OS X Mavericks (10.9) installed. Feedback from all of you would be very important to further streamline and improve the working of this app. PS: Do not remove the .app extension (if it’s visible on your computer) before opening the App please.